If you plan to apprentice yourself to Nick Bantock, you’ll need a lot of art supplies. I had most of them already, although I had to go out and purchase different types of paper at various points in the process, along with matte medium. There were a couple exercises that instructed readers to go to thrift stores and buy, essentially, junk, and something in me bristled at this. I was in the process of getting rid of junk and didn’t want to accumulate more. You’re simply much more likely to find unicorns and fairies than dragons and monsters on the knickknack shelf at Goodwill. Still, I had intended to do every exercise, so I relented, and I’m pleased and amused with this one. Exercise 10 asked readers to find a cheap item that represented themselves (Bantock’s was a taxidermied skunk that had sat so long in a window it was bleached white) and mount it in a box with other items that seemed to go along. My diorama is conveniently situation within a cigar box, which I acquired, along with all the trimmings, at Goodwill. 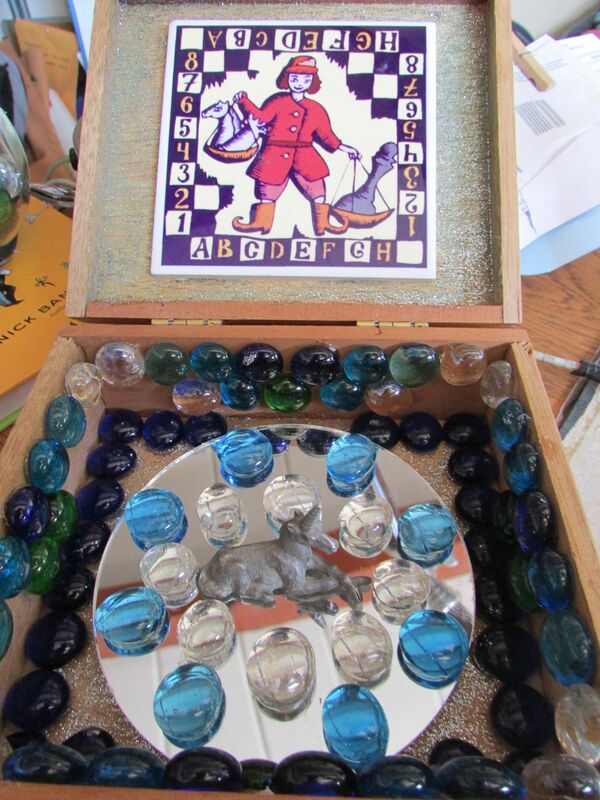 For the purposes of this exercise, I am a pewter unicorn, sitting upon a mirror, surrounded by colored glass, mounted inside a wooden cigar box, with a playful tile roof. The unicorn is chill and so am I. This entry was posted in creative exercises, Uncategorized and tagged 3d, art, creativity, diorama, unicorn on April 28, 2014 by littledragonblue. 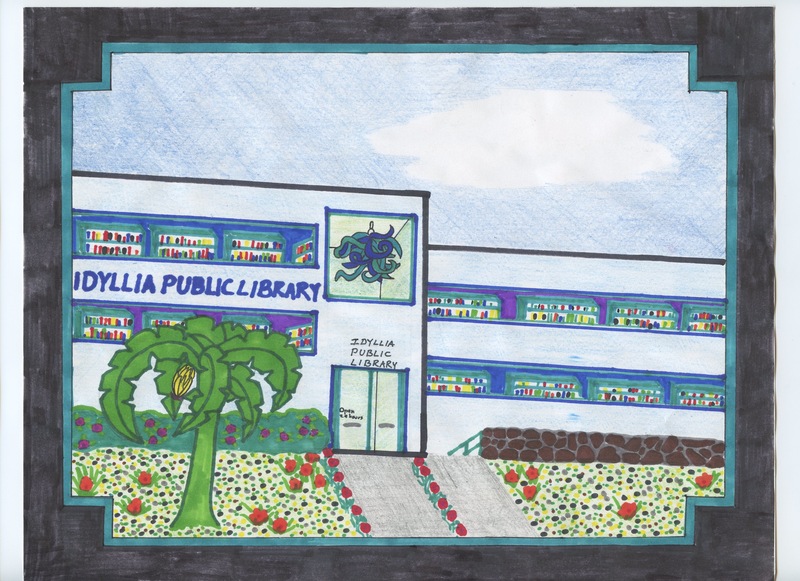 Postcard from the Idyllia Public Library. Yes, this imaginary library in an imaginary country houses a lovely Chilhuly chandelier. The building itself is based on the architecture of the dorm I live in all four years of college. Exercise 7, to create a country, was among my favorite prompts in this book. A rather involved set of instruction suggested details to imagine about the place, and, as I have created many, many imaginary countries in my life, it was easy to build something huge and fanciful and fulfilling. It was possible to flex all the creative muscles in a serious fashion but to withhold judgement, giving reign to creativity. Postcard home: I blanked out my parents’ address, because you know there are some weirdos on the Internet. The second part of the exercise involved creating a postcard from the imaginary country, writing a message home on the back about a vacation in the imaginary country, and then adding a stamp from the imaginary country. I drew the postcard 8.5 x 11 and made that stamp proportionally larger just because it’s easier to work in that format. I used two kinds of markers: Crayolas and Sharpies. Some of the themes from this exercise echoed in later works. Especially proud of this stamp. The economy of Idyllia is based on semi-precious stones. 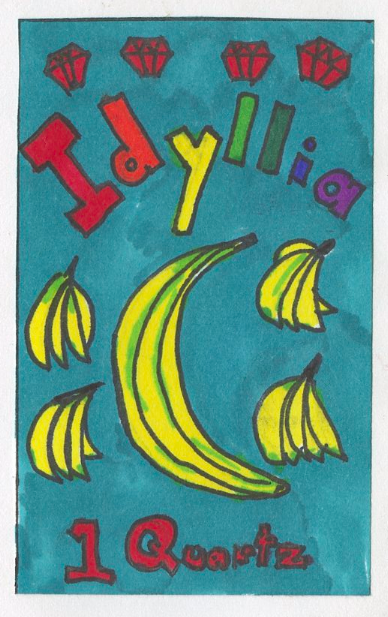 It is a island founded by dragons and covered with banana trees. I am the queen. This entry was posted in creative exercises, Uncategorized and tagged art, colorful, creative, creative exercise, imagination, marker on April 25, 2014 by littledragonblue. 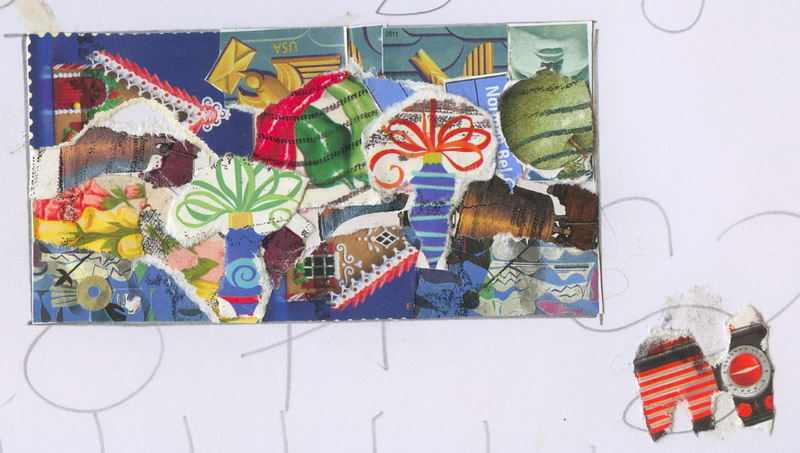 If you’re familiar with Nick Bantock’s work, you know that collage figures prominently. 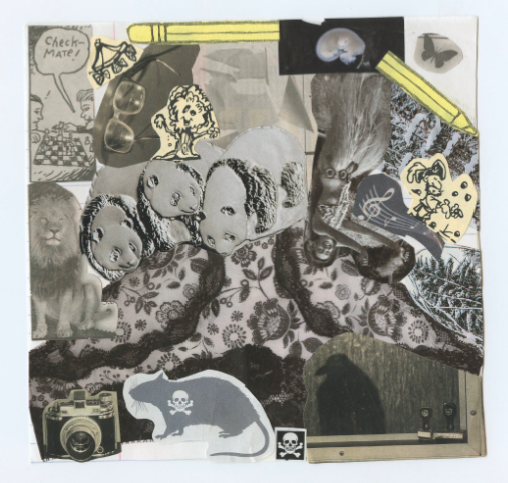 Collages are fun; throughout my life, I’ve often created them, not with the intention of producing a work of great art. They offer a method of self-expression, but they’ve never seemed to require any great amount of creativity. Exercise 4, Part 1: early childhood. I was a bit of an alien. Exercise 4 began with 3 cardboard squares and asked for an autobiographical triptych, complicated by the restriction that the images must all be black and white. In fact, in the 21st century, black and white printing isn’t terribly common. Color printing is so very cheap, and so much more eye catching. Even newspapers are printed in color, but I didn’t have much in the way of newspaper either, since it’s the 21st century. Exercise 4, Part 2: Adolescence. Dark and confusing, morbid and upside down, with moments of hope. For the most part, the materials I had on hand were old National Geographic and Smithsonian magazines. I found a few usable images in the local free entertainment paper, The Tucson Weekly, and one or two bits in my husband’s trade magazines. Toward the end, as the squares began to fill up, I utterly ran out of useful black and white images and finished with a couple things printed in black on colored paper: the invitation to an annual volunteer breakfast I never attend, the map to the Arizona Renaissance Festival, the thank you notes we had custom printed for the wedding. Exercise 4, Part 3: The Present. My life is basically awesome. I am older and wiser, with a supportive life partner and plenty of experience. I know who I am. I was pleased with the final product. These panels do represent my life, even if I don’t feel that collages require much talent or effort. Talking about these images is complicated, though; they’re very personal and meaningful, even with the limits set on the exercise. But collages are easy. I still wanted to learn to draw better. 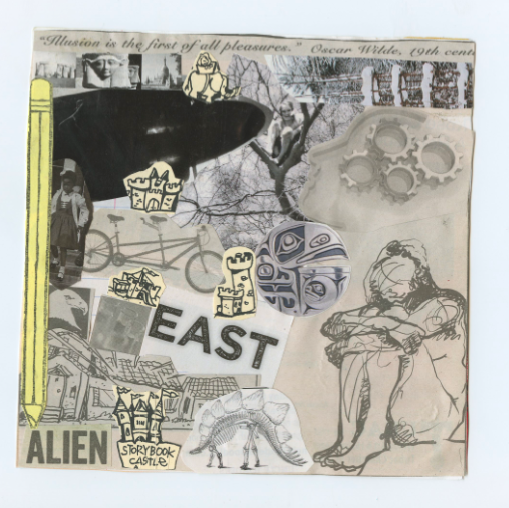 This entry was posted in creative exercises and tagged art, biographical, black and white, bw, collage, creative exercises, creativity, past, present on April 21, 2014 by littledragonblue. As soon as the library sent me the reserve notice for The Trickster’s Hat, I was eager to jump in. Some of the exercises involved writing or other forms of expression, but the majority of them were visual, and I needed no encouragement. It was just what I wanted. Exercise 1: Draw a box with 4 sides, and, in 5 minutes, fill it with as many animals as possible in the box. Then, draw a box with 3 sides, and in 5 minutes, draw as many animals as possible escaping the box. I didn’t love every exercise. Some of them were boring to me. Some of them seemed pointless. Some of them appeared geared to people with even less self-confidence in their creative ability than I had. But I did love a lot of them. Sometimes the ones I didn’t understand at first, or struggled with, or thought stupid, resulted in finished projects I could display with pride. Exercise 3: Amass a quantity of postage stamps. Rip them up (no scissors) and create a small landscape without using any of the stamps’ design elements as the thing they represent. Almost instantly, I was able to focus on creating, setting aside a big block of time every night, looking forward to that time and curious about the next exercise in the book. 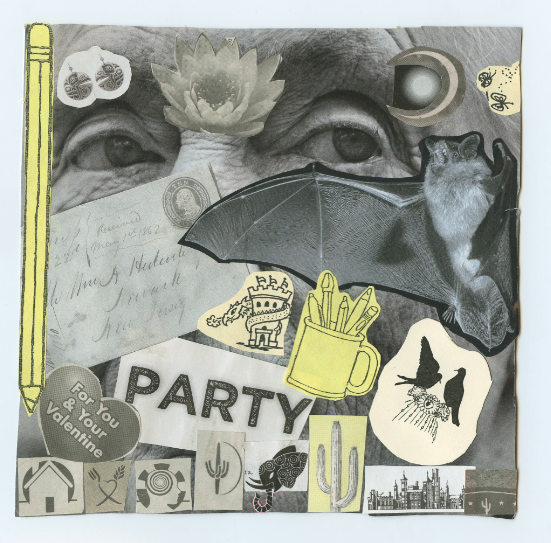 This entry was posted in creative exercises and tagged animals, art, collage, creative, creative exercises, sketch, stamps, trickster's hat on April 14, 2014 by littledragonblue. The Alphabet of Desire was the hardest project I ever undertook. I’m not a magician, except in the sense of being an artist, and I found that the project asked a lot of me. Some lettering work done for inspiration in the early days of the Alphabet of Desire. The font is based on Lucinda Black Letter. I was unable to generate momentum, for instance, until I had organized all my books (over two thousand) into Library of Congress organization. 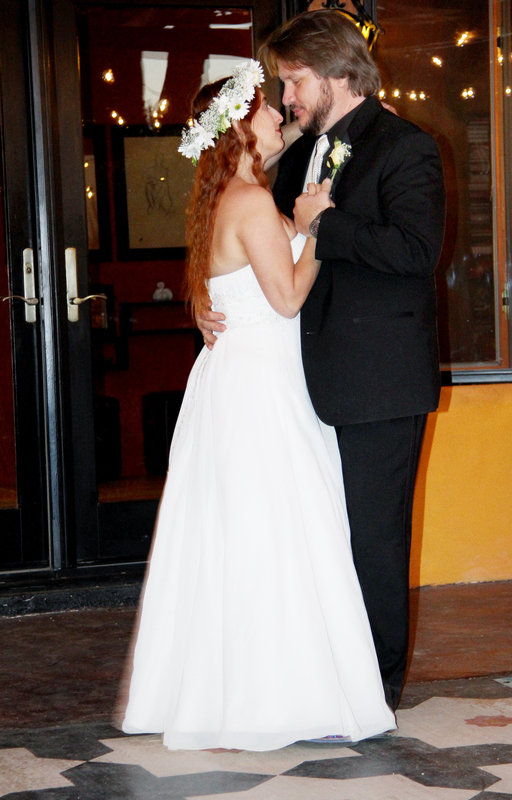 Whenever I gained a little traction, something (for example, my wedding) slowed me down. I simply was not as good an artist as I wished. 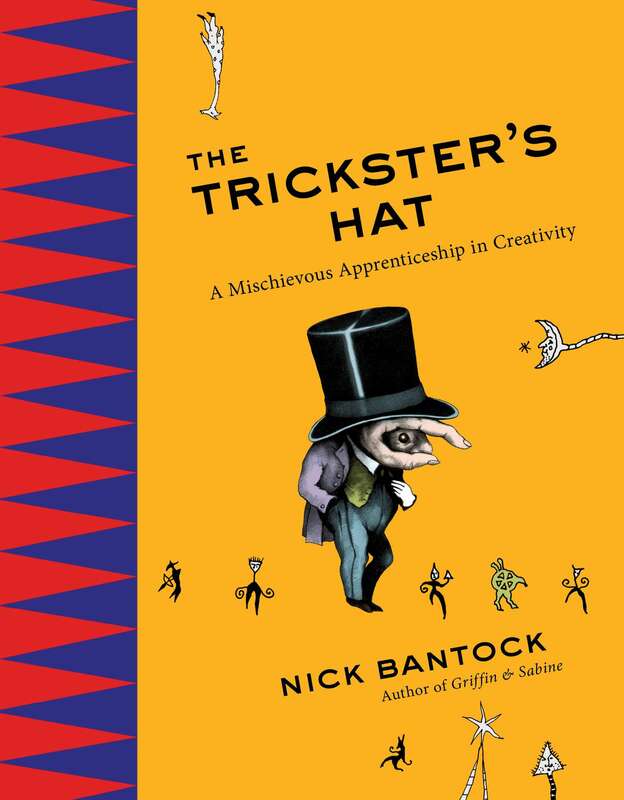 After reading an advanced review of Nick Bantock’s The Trickster’s Hat: A Mischievous Apprenticeship in Creativity, I wondered if a book could kick start my creative drive, help me immerse myself in art, and establish the foundations of regular creative work. The book hadn’t actually been published yet, but my local library system bought it for me as soon as it came out. 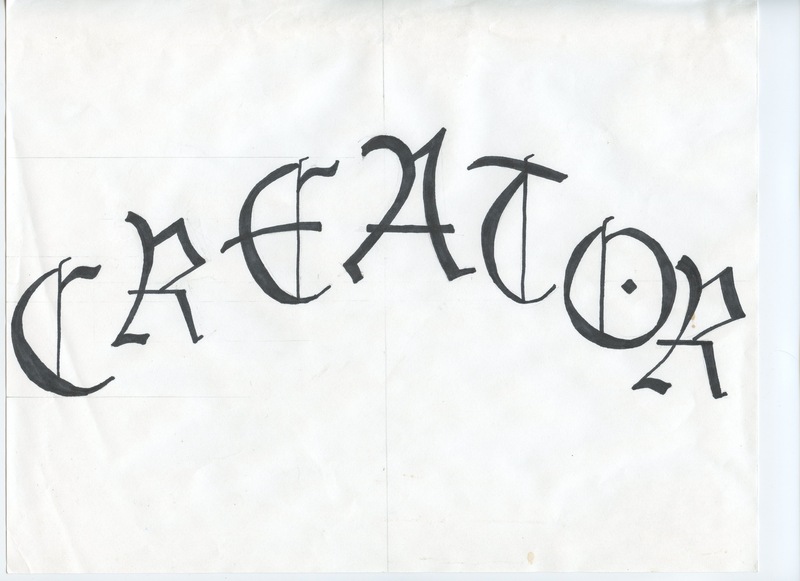 This entry was posted in creative exercises and tagged art, creativity, lettering, trickster's hat on April 7, 2014 by littledragonblue.